Instead of my usual (sort of) Wordless Wednesday post, I thought I would acknowledge the second anniversary of Hurricane Sandy. I know a lot of the world wasn’t affected by the storm, but along with 9/11 and the loss of my mother, it was one of the defining moments in my lifetime. (May there not be too many more of those, thanks very much). My neighbor shot a video walking down our block a week after the hurricane. You can see our house near the end with the Amazon River Mermaids sign out front. The video will give you some small idea of how much damage there was, and we were by no means the worst off. We were really, really lucky. Sure, we lost lots of stuff; everyone did. But unlike many of our friends and neighbors, most of what we lost was replaceable. We’re okay, but it’s still one of those anniversaries I need to honor, and I don’t think that will ever stop. Yes, it took a lot out of us, but more than that, it helped me realize how fortunate I am, and I don’t want to lose sight of that. That’s enough of that. Here’s a poor zookeeper trying to give two toddlers their medicine. You’re welcome. I’m glad you didn’t get hit harder. Nothing to feel guilty about. I’m tired. You took me through too many emotions in one post. That video is chilling. I confess to have forgotten how bad it was. Thanks for posting that song, it’s always been one of my favorites. And I could watch the panda video all day. I want a job where I can shake my charges to the ground. I have that job (minus the cute), and it’s overrated. I’m sorry I wore you out, but thank you for really paying attention. You always make me feel heard, and I really appreciate it. I wish I could put everything this makes me feel in words, but even tho putting things in words is how I make my living, I can’t. The number of people I would truly miss if they were gone from my life is measured in a few dozens but you are in the first dozen. Thank you for staying strong and surviving and being my friend. Even having heard you tell me how bad it was in your individual case (as it was for many and worse for others), that walking video hits home and made me feel ill (no apology necessary). You should not stop commemorating the losses even if largely material on your case. It is something we should not forget too soon. It was a big friggin deal, to quote a neighbor. Your attitude and gratitude surrounding Sandy was great to hear. The video brings back memories of proof of life and recovery. Really enjoyed your take and personalized ” thank you notes” . Also loved how you paired Dylan’s Shelter from the Storm with your story and lastly the cute pandas. Thank you, lovely. We’re big fans of yours, too. What we’ve been through is big, but it didn’t break us. Hugs! 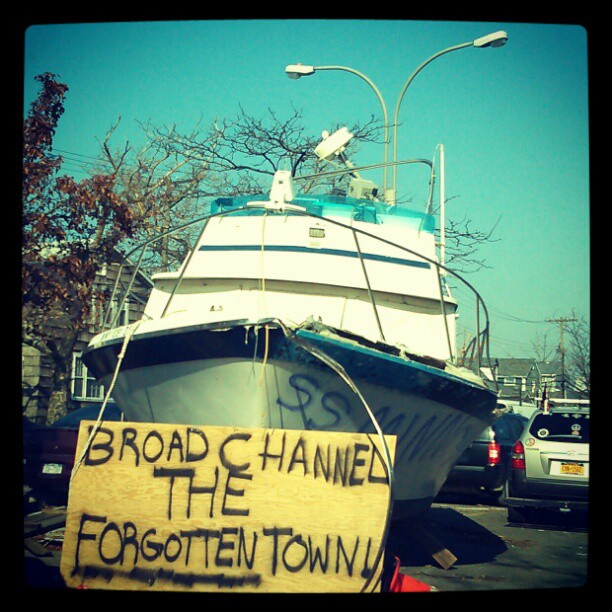 It breaks my heart to see Broad Channel like this. Both my parents were raised there (Smitty) and I was born there. I am still in touch with the binding friendships that grew from back then. The old girl is recovering. It’s slow, but it’s happening. You should see her now. We’re on W 12th Road, the worst of the moon-tide flooding blocks, so the Army Corps of Engineers is working on raising our street. Everyone’s getting ready to raise their houses, the houses that were torn down are finally reappearing. It’s a real trip. Why is it that Broad Channel is rarely on line? This is the latest one in wordpress. I was born there and can understand why they would want to remain out of the limelight – is this the reason? If you’re on Facebook, friend request Broad Channel Civic. They post every day. It’s mostly (stunning) photos, but they also post about upcoming events and fundraisers. I think you’d enjoy it! Good morning. I wanted to make sure you saw my post yesterday. It included a video interview with some of the Broad Channel residents who helped out on 9/11. Thought you might be interested.